One of my biggest, deepest-darkest secrets is that a few times a year, I buy a frozen pizza. I used to do it on the sly, but lately I’ve even got so brazen that I’ll go out and do it in broad daylight. I am sure after my goings on about the popularity of frozen foods in France that I was going to get busted one day standing in line, clutching an icy box containing a pizza jambon speck, roquette, mozarella at the frozen foods store. Yet so far I’ve escaped detection. I just got a copy of Serve Yourself by Joe Yonan, a nifty book full of recipes for cooking for one. Joe came to Paris a few years ago and like everyone who meets him, I was charmed by his graceful intelligence and instant friendliness, and we ended up sharing a couple of meals together. I’d seen an advance copy because I wrote a quote for the back, and liked the idea of tacos, frittatas, and individual meatloaves rather than the salmon filets and boneless, skinless chicken breasts that are often the staples of “cooking for one” recipes. (Okay, another one of my secrets is that I actually like boneless, skinless chicken breasts.) 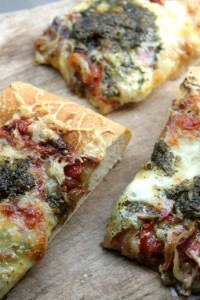 In addition the book has a few individual pizza recipes in it, all using a no-knead dough. Everyone loves the no-knead bread and even though I’ve tried it a few times and have a few qualms with the flavor (and suffered the wrath because of it…) it’s the recipe that Joe uses in the book and I’ve used it here because I’m always willing to give something another chance. It is very easy to make – you just stir everything together and let it sit all day. And because it’s quite soft, it’s completely easy to shape into circles with your hands and very forgiving. So for those of you that don’t have access to leftover pizza dough from a restaurant, don’t worry – this shouldn’t intimidate anyone. There’s a few other combinations for pizza in the book, but I went rogue since my all-time favorite pizza includes potatoes. I’m a big fan of starches, and when crumbled bits of salty-tangy blue cheese melt over a crispy crust covered with rounds of pre-roasted potatoes, I’ll gladly give up my place in line at any frozen foods store. For those who don’t have wood-fired pizza ovens in their houses, or even pizza stones, Joe came up with a great technique using the back of a cast iron skillet for baking off the individual pizzas. I was kind of surprised how well it worked and even though I often grab my green non-stick pan instead of my cast iron skillet, I think I’ll be pulling out my heavy pan and upending it in my oven a little more frequently since learning this technique. No-knead dough recipe adapted from Serve Yourself by Joe Yonan, from an original recipe by Jim Lahey.The main thing to remember when making these individual pizzas is that the skillet is very, very hot. I’ve actually written down on a notepad “HOT PAN” in large block letters, and kept it next to my work area to remind me so I don’t touch something that’s hot that doesn’t look it.When making a lot of pizzas at once, especially if I have guests, I pre-bake the dough slightly (as I did here) so I’m not struggling with it and making a mess when friends arrive. 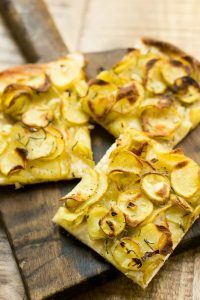 If you’re having company, you can also have the dough rounds topped with the potatoes and cheese, then just bake them off right before serving, since they only take a few minutes under the broiler to finish.Because potatoes star in these pizzas, try to find flavorful varieties. Often greenmarkets have farmers who grow specialty potatoes and those are worth seeking out since they’re a lot tastier than commercial varieties. 1. 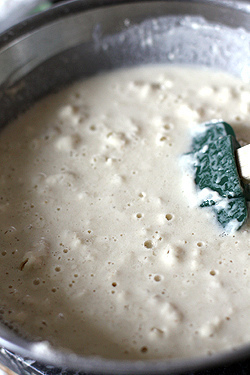 In a large bowl, mix together the flour, 2 teaspoons salt, and yeast. 2. Stir in the water until well-blended, then cover the bowl with plastic wrap or a dishtowel and let sit at room temperature for 8 to 12 hours. 2. Sauté the onions in a large skillet, stirring frequently over moderate heat, seasoned with salt and pepper, until soft and translucent. They will take about eight minutes. During the last few minutes of cooking, add the fresh thyme leaves. Let stand at room temperature until ready to use. 3. 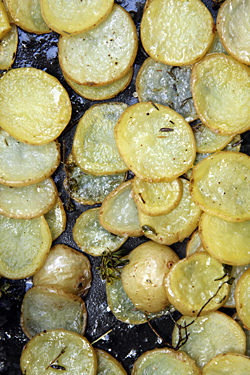 Slice the potatoes in a little larger than 1/8-inch (.30cm) slices and toss them with a just enough olive oil to lightly cover them, a few teaspoons, along with salt and pepper and sprigs of fresh thyme. 4. 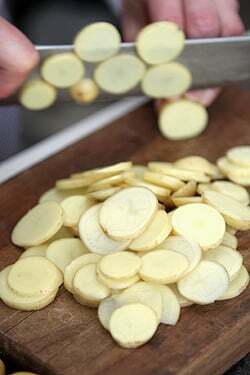 Spread the potatoes on a baking sheet in a single layer and bake for 15 minutes or until the potatoes are cooked through. 1. Heat the broiler in the oven and set the oven rack so it’s 5-inches (12cm) from the heating element. 2. Set a cast iron skillet on the stove top over high heat and let it get very hot. 3. 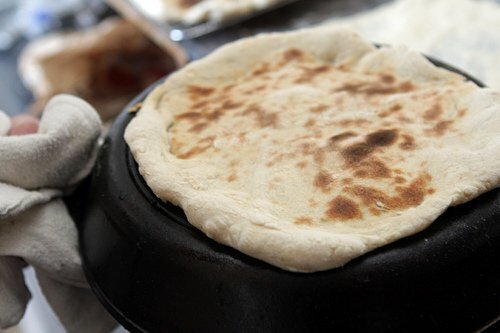 Shape the dough into 8-inch (20cm) rounds on a lightly floured surface, then working one-by-one, overturn the cast-iron skillet and carefully put a round of dough on the upturned bottom of the skillet, using your fingers to nudge the dough to the edges and being careful to avoid touching the very hot skillet. 4. Bake each round of dough individually under the broiler until each is lightly browned and “set” – they will only take a minute or two, so watch them carefully. 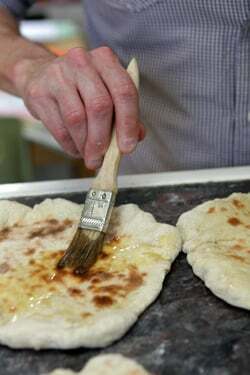 As they come out of the oven, pry the dough off the pan (you may need to use a spatula if they stick a bit) and set each one on a wire cooling rack. 5. Brush each round of dough in the center with garlic oil, making sure to get some of the minced garlic on each round. Divide the onions over each round of dough, leaving a border, then top with potatoes and crumble blue cheese in large pieces over each pizza. 6. Run each pizza one-by-one under the broiler, on the overturned cast-iron skillet, then serve immediately. -I use regular yeast (also called “Active dry” yeast) rather than instant yeast, which the original recipe calls for. Some people feel that you should proof active dry yeast, but with the long fermentation and the wet nature of this dough, the yeast will be activated during the long fermentation process without proofing in advance. If you’re not sure if your yeast is good, sprinkle it over some of the warm water (100º – 110ºF, 38ºC – 43ºC) and let it stand for ten minutes. If it starts to bubble, it’s fine to use. If you wish to use fresh (cake) yeast, according to Fleischmann’s yeast website, 2 1/4 teaspoons of active dry yeast = 1 cake (0.6 ounce) of fresh yeast. -As mentioned, I’m outvoted on the no-knead dough question, and prefer a traditional dough enriched with olive oil. But you can certainly swap out your favorite pizza dough and use this topping. -Bread flour is available in most supermarkets. In France, it’s called farine boulangère à pain of farine pour pain. -Possible variations would be to add cooked bacon pieces to the pizzas, along with the potatoes, or omitting the bleu cheese and drizzling the finished pizzas with crème fraîche and chopped chives right before serving. Another cheese, like Comté, Gruyère, or mozzarella could be used. One last idea to toss some fresh arugula in a bit of the garlic oil and put a tangle on top of each pizza right before serving. -I did try baking the pizzas on the wire oven rack with the toppings but found the bottoms didn’t get as crispy as I liked. If you have a pizza stone, you could likely adapt this recipe to use that rather than a cast-iron skillet. Read the instructions to make sure it will stand up to broiling. 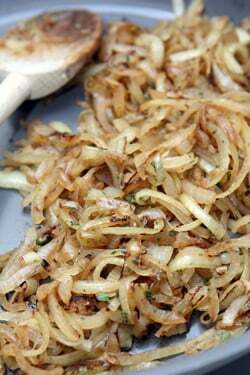 -The potatoes and the onions, as well as the rounds of dough, can be pre-cooked up to eight hours ahead. -If you want to freeze the pizzas, once cool, stack them in a layer with a sheet of parchment paper in between each pizza, then freeze in a zip-top bag. I love potato on pizzas! The blue cheese looks like a nice change from typical mozzarella. 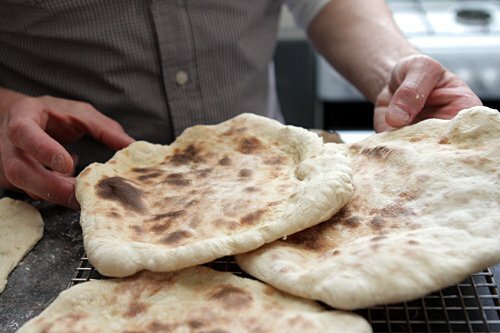 Have to say though, that pizza dough looks a lot like naan bread (not that there’s anything wrong with that). The tip about using an upside down pan is very useful; I often to struggle to get that perfect base. My guilty secret is that I love the frozen jambon-fromage pancakes that you can buy in the supermarket. As soon as I get to France, they are the first things that I buy. And I had all but given up making pizza. I think I’ll rewind. Tack David! The cast iron skillet method reminds me of how Pizza Hut cooks their pan pizzas. The pans Pizza Hut uses looks like cast iron but I’m not sure. They use a special pair of tongs to to lift the hot pans out of the oven. From your choice of toppings, I guess you love a good cheese, onion, and potato gratin. That same type of reasoning wouldn’t work with me since Hawaiian pizza is my favorite. While I’m willing to try most types of pizza, there are exceptions. Barbecue sauce and alfredo sauce are a definite no-no in my book. Now that’s one handsome looking pizza base. Divine! I don’t have a wood fired oven OR a castiron skillet but I do have a pizza stone. I was really starting to sweat it there for a minute. What a good idea with the cast iron skillet! And I’m definitely going to try the no-knead pizza dough. Thanks again David for your delicious ideas….. This is the perfect recipe for me! By the time I get to the end of the workday, I don’t want to do something like make pizza dough. I think I’ll be having some weeknight homemade pizzas now that I have a recipe that requires me to make the dough in the morning! A man after my ninja potato loving baby’s heart. I definitely have to try this as soon as possible! I often keep a package of scallion pancakes in my freezer, and use one as a basis for a potato and blue cheese pizza. You cook the scallion pancake first (or, of course, you could make it from scratch if you had more energy than I do), then top it and throw it into the oven. It’s an amazingly good combination and a nice change-up from pizza dough. I have a Lodge cast iron pizza “stone”. Would that work the same way as an overturned Lodge cast iron pan? Or am I missing something here? Elsie: Yes, in the notes I mention that a pizza stone works great for crisp-bottomed pizzas, although do check with the instructions to make sure it’s safe if you use the broiler. Lydia: When I was a kid, we used to use English muffins. Those work well, too! Hum… It looks yummy ! Thinking of getting a few potatoes and foregoing the arugula-prosciutto pizza slated for today. Or doing both. I never actually thought to add blue cheese to potato pizzas, but I can’t imagine that there could be a better and more flavorful cheese to do that with! 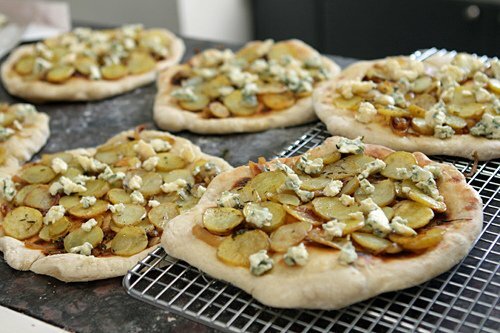 I always found potato pizzas to be rather bland, but blue cheese is so salty and rich and delicious; I’m going to be treating myself to this this week! 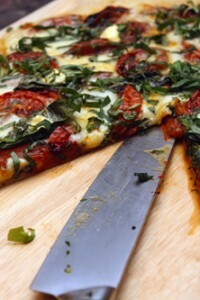 The combination of the ingredients for the topping in this pizza is slightly unconventional ans so, I love this recipe! The cast-iron-skillet method has to be given a try. Thanks for sharing this recipe! Not a fan of blue cheese, and yet, there was a restaurant outside of Pittsburgh that served homemade potato chips covered in melted blue cheese. I practically pushed everyone else out of the way to get to the plate. One of the best things I’ve ever eaten. I use the skillet method also, but differently: I preheat the skillet under the broiler, remove it from the oven, assemble the pizza inside the skillet and then put the whole thing back under the broiler, as close as I can get it. The top cooks quickly and to finish the bottom, I heat it on the stove top until the crust looks the way we like it. My husband loves pizza and this his is favorite homemade method for it. The kitchen stays cooler, too, just using the broiler, and that old skillet gets a good workout. I received a copy of Joe’s book in the mail a few weeks back. It looks fantastic. I wasn’t really thinking about the pizzas when I gave it a first look through. But, after reading this post, I just might give one a whirl. They look amazing! Ca donne faim cette petite pizza!!!!! I am already feeling the smell of cooked pizza in my oven! I have some pizza dough from the weekend, you gave me a very good idea of what to do with it tonight! thanks!! Brilliant. Both the recipe and using a cast iron pan as a pizza stone. I wish I had a slice right this minute! @Darlynne, do you remember the name of that restaurant? We’re in Pittsburgh now. We spend spring and fall here, our hometown. David, I was always under the impression that you could not put a cold ingredient on a hot pizza stone. I have had one crack on me in the past. Maybe the pizza wouldn’t be too cold to cause this, the same way a frozen pizza (like from Picard) would. I would be reluctant to put one of these homemade pizza circles in the frozen state on the stone. I thought it was a universal no-no to all baking stones. David, I love the idea of blue cheese with the potatoes. I have to add it to me recipe–I use mozzarella and Parmesan. How plebeian! Your blog is truly the most useful, informative, and beautiful I know of. Thank you for always sharing such great recipes and beautiful photos. I can’t wait to try your dough method. Those crusts look amazing! my pizza stone split (and I don’t think it was the cold pizza on the hot stone conundrum), so we finally got a cast iron pizza pan from Lodge and it is seriously the BEST thing for making pizza in our home oven. really excited to try this topping combination. @Cyndy: Sorry, I don’t. I know it was outside of town and that’s all I’ve got. Apparently the combination is very popular and a Google search shows many restaurants make them. If you use blue cheese, maybe you should also use blue potatoes! This looks great David. I will have to try this one. I have also had blue cheese with apples on a pizza (flatbread) at a place west of here in Banff called Coyotes. Absolutely love it. Keep up the good work. I look forward to your posts. We purchased a large, rectangular griddle with a smooth side and a ridged side from Lodge, and use it exactly like the frying pan method–except we place the griddle on the bottom rung of the oven at highest temperature setting until it’s really hot, and then place the pizza onto the griddle–non-ridged side–while it’s in the oven, using a wooden pizza paddle sprinkled with corn meal. This prevents the hassle of getting a really hot big cast-iron thing into the oven with stuff on it. We don’t broil–just use the highest baking heat, which sadly is only 500 C on my old appliance. I mention the griddle because it really works well for in-the-house BBQ’d meats, too–a closely proximal appearance although without the smoky taste unfortunately. I use the ridged side for steak and use tongs part way through to make the cross-hatchings by turning the steak a quarter/half clockwise, then flip to do the other side the same way. If you like it rare, you must be very attentive not to overcook, though, just like on the BBQ. This gives a beautiful crust and juicy inside to the meat, and the cross-hatching always impresses the guests! Then you use the pizza paddle to remove the pizza(s), also avoiding having to haul the heavy, hot griddle out of the oven. The griddle idea (and he mentions cast-iron frying pans too) came from Mark Bittman’s “How to Cook Everything”, which is one of my “go to” cookbooks for general recipes and interesting adaptations of common recipes. I loved to make my own pizza back in the USA, an old GE oven with a pizza stone, preheated for half an hour at 550°F: thin crust crispy pizza every time, in four minutes flat! I can’t figure out why my Viennese oven will not cooperate, it takes half an hour to bake a pizza, no matter how I try. Should I get myself a cast-iron skillet? 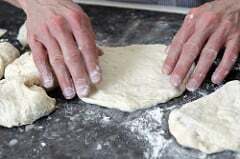 I use the no-knead dough for pizza as well but I make a whole grain version using white whole wheat flour, which is a lighter variety of whole wheat flour made from hard white winter wheat, and I increase the yeast as well as the water, and add a little olive oil. The dough ends up being about a 2 to 1 ratio of flour to water, and I also add a little more flour when I go to form the dough into pizza rounds as it is a little too sticky to handle otherwise. I think the higher hydration works well for the whole wheat flour, which comes out very soft and aerated after the all-day rest, with a similar tender texture to that of all-purpose or bread flour. Whatever flour you use, I think the no-knead method is genius for great texture with pizza dough. The potato and blue cheese and thyme topping sounds wonderful, and is now in the pizza queue for versions to make this summer! I must be using oil with too low of a smoking point. Every time I put my cast iron pan in the oven to season it, it smokes immediately. I’ve been using canola oil, which I thought had a high enough smoking point. But I so want to try this idea. We have this little restaurant in the (SF) south bay called Frankie, Johnny and Luigi’s, Too. Their pizza crust is so good. 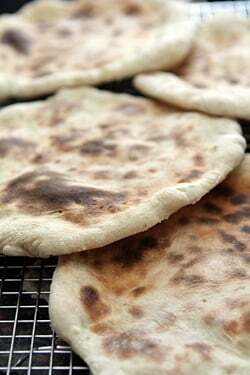 The crust reminds me of the texture of the no-knead bread; airy and full of holes with an artisian flavor. I could eat the crust all by itself! My favorite of their pizza choices has dollops of fresh ricotta placed on the pizza. It is heavenly. I may just have to give this recipe a whirl, but maybe add some ricotta mixed with the blue cheese. I am still working on trying to get pizza dough onto a hot pan in the oven. I keep cheating and using parchment cut to crust size to slide the pizza onto the stone. Maybe I should practice the ‘whip-the-cloth-from-under-the-dishes’ trick with a cornmeal coated cookie sheet as my pizza peel..since I don’t have a peel. Should work. Beautiful looking pizza! And thank you for the cast iron pan tip, I will be using that for sure! I’ve actually been making a variation of that no knead recipe for my pizza dough(but I use some whole wheat) and I love it. I love your idea of blue potatoes with the blue cheese! Wow. I’ve seen recipes for potato pizza before but this is the first time I’ve actually wanted to make one! I love potato pizzas but I have yet to try it with blue cheese though. I am definitely going to have to try this next time. It looks just too delicious to pass up. I am now craving a potato pizza, and I just happen to have blue cheese in the fridge, so I am most def grabbing some taters at my next trip to the g-store. I can’t wait to try this recipe. I think it would work great sliced and served as an appetizer for a cocktail party. I’m thinking along with your version, I’ll also try fresh rosemary instead of the thyme and top with crème fraîche, omitting the bleu cheese. Thanks for posting the recipe and great photos! I can not wait to try this pizza recipe! I am leaning toward linguesa, manchego cheese and a little feta crumbled on top right out of the oven. The idea of using the bottom of an iron skillet is impressive. I have been promising my sister’s kids that we will have a pizza party, I think I’ll schedule it, sooner than later. Now I know what to do with the blue cheese I served the other night at my new book club, my dog grabbed it off the coffee table & so I had to whisk it away to the kitchen because nobody but me would dare eat it after rescuing it from the dog’s mouth. It’s French & pricey so I couldn’t throw it away. A little heat should sterilize it, no? Its cold, raining and miserable here in Sydney, Australia at the moment. This pizza would be the perfect dinner and pick-me-up. 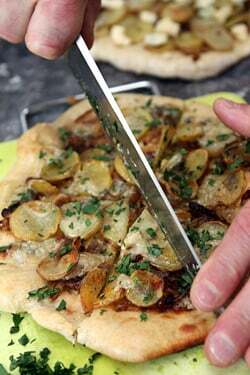 I love potato pizza and with blue cheese, onion and thyme, yum! That said, even the frozen variety you speak of would be a nice change to the ones available here, they are so bad you wouldn’t buy them. If we had frozen pizza here with jamon speck, roquette and mozarella we would be impressed. Potatoes on pizza & blue cheese,you’ve taken 2 of my favorite things and turned them into heaven on crust. @Cyndy: The restaurant I mentioned is The Pines Tavern, it’s in Gibsonia. I have no idea if you’ll see this post, but information is available on their website. The menu still shows their tavern chips with white wine sauce and blue cheese. I wish I could be there now. This post makes me so happy that the insane low-carb craze is over! Remember that? So silly. Bring on the potatoes and pizzas! I have to agree with you that, although a great idea, the no-knead bread recipes that I have made out of Lahey’s book and others have fallen flat on the flavor. America’s Test Kitchen did a revamp of Lahey’s recipe by adding 1/4 cup of mild-flavored lager (3oz) and 1 tbsp of white vinegar to the dough, and they do knead it only 10-15 times (so, it’s an “almost no-knead” dough) after the first rise to shape it up. It produces some of the best bread I’ve had.. dare I say that I even like it better than Acme’s bread?? I haven’t tried it for pizza, but I think that your post has inspired me to see how it all works out on that end. David – thank you for this blog entry and recipe . . . although I’m a fan of the America’s Test Kitchen pizza dough, it involves planning ahead — and pizza winds up relegated to weekends which then get busy with friends, chores, etc. But, like Erin, if I can mix up the dough in the morning and let it rise while I’m at work, that’s perfect! I have a cast iron griddle that I use not only for cooking my pizza, but that is also excellent for reheating leftover pizza (MUCH better than zapping in the microwave) . . . when I first got it (as a gift) I didn’t think that I would use it much — I’m amazed at how much use it gets. When I called Seattle’s Pagliacci Pizza to order delivery and they told me their special was a pizza with potatoes, I thought it sounded about as appetizing as a topping of jellly beans. But I ordered it and it was absolutely delicious. And your recipe sounds like an even better take on it. You don’t need to upend your cast iron pan at all… A good technique is to put the oiled pan on the stove, slide in the rolled dough, add the toppings, turn the heat to medium-high and cook until the bottom is browned. Then slide into a 500F oven until the cheese is melted and bubbly. Easy peasy! Christyna: There’s a variation in the book that uses spelt flour, but I just wanted to try it closely as written (although I did dial up the salt.) 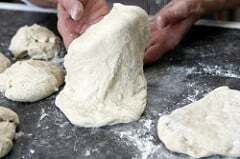 I am not sure that no-knead dough is better than regular dough and I do think a dose of olive oil adds a lot of flavor, and perhaps mixing in another kind of flour as well. I have never tried potato on pizza! This is a must try so I will definitely be making this in my humble kitchen! 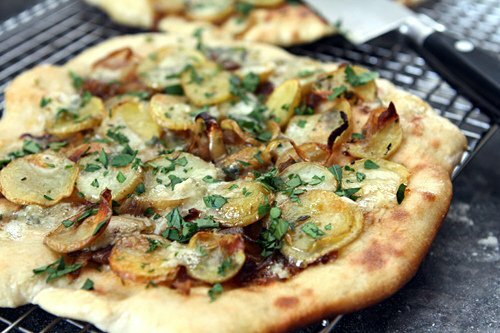 I love potato on pizza….especially when the potatoes are pre-roasted! 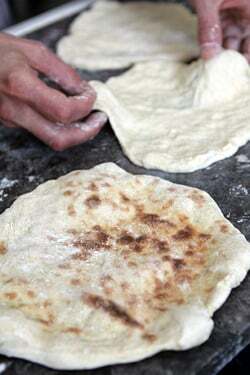 I’d love to try this no-knead dough. By the way, I’ve had good luck with Joe Yonan’s book — I adapted a Spanish tortilla recipe from Gluten Free Girl who adapted from Yonan. It was terrific! If you’re interested, you can see my version of the tortilla here. Great recipe, though. I think I’m gonna buy the book. Actually, this would be great for kids, if you use blue potatoes instead of regular ones. michael & Jun: I have to say, I’m not all that wild about blue potatoes. To me, they’re rather crumbly and starchy, although they certainly are pretty. Tom S: Not much in cooking is new anymore – such as grilling pizzas, a technique which was popularized by Al Forno in Rhode Island. Or even the warm chocolate cake with melting centers – I know at least 5 people that claim to have invented it. But using an upended cast iron skillet was new to me, and it works great! THANK YOU THANK YOU for saying what I have always thought about no knead bread. It has no flavor! Just also wanted to tell you that I had a gift card for Sur La Table and used it to get an ice cream maker. Another gift card from Amazon procured me a copy of The Perfect Scoop. Fabulous book! I’m anxiously awaiting the heat so I can start making chocolate sorbet. Haven’t tried potatoes on pizza before, sounds interesting. And I thought I saw it all after seeing the Aussie pizza with the fried egg. Hey all, I use my cast iron griddle for a pizza stone and it works wonders. No worrying about breaking the thing, and it makes crusts nice and crispy. Great for bread too! Hey David – question about yeast in France: is the stuff in packets here “instant” or regular old “active”? Made some sticky buns that just didn’t rise right and I’m wondering if it’s because I assumed it was instant…. MARVELICIOUS! i took it out of the oven, cut it up n bfr u know it.. half was gone! this is my first potato & cheese pizza and i must say i’m a convert!!! muahs!!! spectacular mr leibovitz! thank you! Sounds great! We are getting some potatoes from our farmer’s market this weekend. If we were going to cook the raw dough on our pizza stone, should I roast the potatoes separately and top the raw dough with the roasted potatoes and sauteed onions? It takes about 10 minutes or so to cook the dough on our pizza stone. Do you think another 10 minutes would be too long for the potatoes? Tried this recipe over the weekend and it will be a sure thing next Girls Night! Mmmmmarvelous. I love the idea of pre-baking the crust on a cast iron skillet. Thanks for the great tip! I, too, am a fan of potatoes on pizza. I like potatoes, rosemary, and mushrooms as toppings. But I’m definitely going to try this version–blue cheese makes me smile. Yum, I’m a huge fan of cheese! With that said, have you ever tried making pizza with some less-common ingredients, like goat cheese or sweet potatoes?